Would you like to be part of a special day to celebrate and promote all that's special about the Yorkshire Dales? I'm creating a Dales Discovery Day on the 17th March (as part of English Tourism Week). The idea is to use this day to really raise the profile of our fantastic area, celebrate and share ideas for ways to enjoy it, predominantly through social media. I only had this idea a couple of weeks ago so it's been a bit of a whirlwind and I really hope you can get involved! It's got the potential to benefit everyone in the Dales and kickstart the 2018 season. Facebook, twitter and all your other social media. During this last week I'm finalising the 10 Free Discovery Treasure Maps, which we'll launch from www.DalesDIscoveries.com on 17th March. You'll then be welcome to link to these on your own website, download and print off, and use for your visitors. We'll be adding other locations over the summer and promoting these during the rest of the year. I'm now also creating the list of 100 Different Ways to Discover the Dales. If you have any ideas you'd like me to include, please email asap. 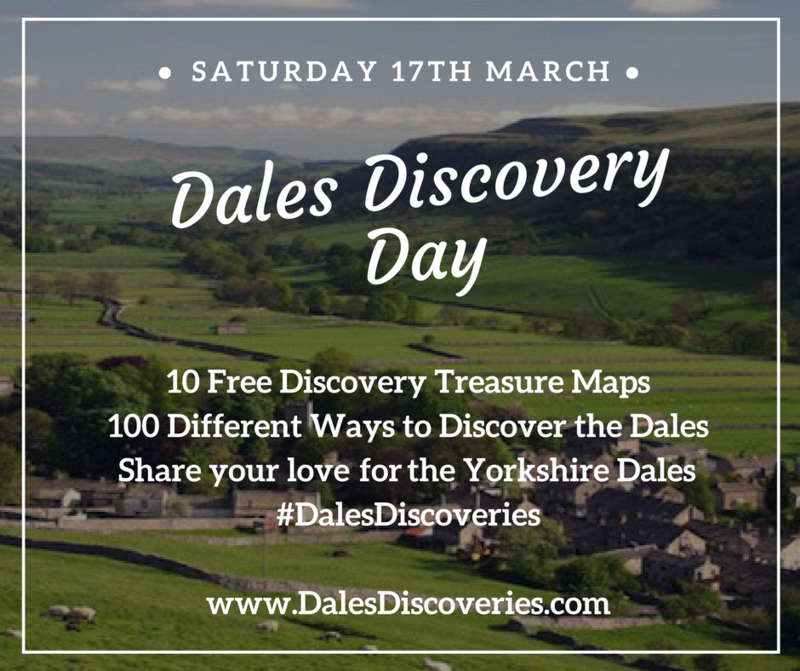 Please facebook, instagram, tweet etc using the hashtag #DalesDiscoveries sharing your favourite places, things to do, ideas for activities, recommendations for places to eat, drink, shop, best views and all the other reasons why you love the Yorkshire Dales. Could we get #DalesDiscoveries trending? Don't hold back - go overboard, and really show you care! You might want to pre-schedule some posts in advance. Please be generous and share others' posts as much as possible. I will be collating some of the ideas that came out during Dales Discovery Day to create a new Insider's Guide to the Yorkshire Dales which we'll then make available to everyone to distribute far and wide, share on social media and continue to promote the Yorkshire Dales over the Summer and Autumn. ​Share and celebrate all that you love about the Yorkshire Dales and discover attractions, amazing people, incredible artists and craftspeople, places to eat and drink, and off-the-beaten-track quirky features. Find out the best activities from the people who know: locals and regular visitors by following #DalesDiscoveries and get a real insider's view of the Yorkshire Dales. With over 40 Dales to explore, we'll be uncovering some secret places as well as celebrating favourite locations. Best things about participating in Dales Discovery Day? You don't have to do much - just join in, share your love of the Yorkshire Dales & your recommendations using #DalesDiscoveries. Here's the latest information on what will be happening as part of Dales Discovery Day on 17th March 2018.